October 1st, 2013 – San Diego, California While crypto currencies have been around for several years now, they have yet to establish themselves as a viable alternative to traditional currencies for most transactions; including digital ones. The main reason for this is that acceptance of Bitcoins and other crypto currencies are sporadic which inherently limits their demand. Merchant involvement is further discouraged as the perceived value becomes relatively volatile due to this deficiency of legitimate sources of demand. However, the scene is slowly changing with the emergence of vertically integrated markets that embrace digital crypto currencies such as Bitcoin. A perfect example of one of these is the open source 3D printing market. Open source fused filament fabrication (FFF) has increased in popularity at around the same pace as digital currencies over the past several years. While these two markets are completely independent of each other in function, the cultural impetus, which has made them successful, shares a common thread. Both Bitcoin and open source 3D printing have a history of sticking it to the man. Bitcoin in particular was devised as a way to circumvent government monopolies on currencies by providing a stable value storing alternative that is easily transferable, divisible and can not be easily manipulated. 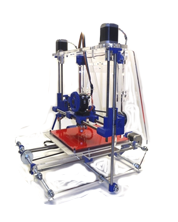 As with most open source projects, RepRap style 3D printing was devised as a way to circumvent commercial monopolies on patented rapid prototyping techniques while simultaneously providing a functionally competitive alternative at a higher value. Today’s Bitcoin holders and FFF manufacturers are both early adopters, making a perfect match for vertical integration. The first step to fully integrating crypto currencies into the 3D printing industry community was the development of hosted wallet solutions such as Coinbase. These services have made it easier for the online merchants of printing supplies to integrate Bitcoin into their existing shopping carts without requiring major redesign to the checkout process. These services became even more popular once merchants were allowed to automatically transfer the transaction funds to another currency of choice. This feature mitigated the remaining downside risk of Bitcoin volatility allowing the merchants to effectively save money on transaction costs versus their next available alternative. Once filament suppliers began solidly accepting Bitcoins, the 3D printing services followed shortly after; accepting Bitcoins from their customers and having the material costs paid for directly. This further reduced transaction costs and fees in the supply chain leading to a higher value product to the customer. The rapid prototyping 3D printing industry has greatly benefited from the emergence of crypto currencies and vice versa. As these effects are felt in additional industries, the value of alternative digital currencies such as Bitcoin will both increase and become more stable. For now, the open source 3D printing industry will happily embrace its role in transitioning Bitcoins from being a tool of the fringe black market to becoming a legitimate digital alternative to conventional paper transactions.